I had a full weekend in New York City recently, and it was about time too, since I hadn't been to the Big Apple in almost a year. I probably won't be heading back anytime soon, at least not until the RSC does their residency in 2011. So I was very pleased that all three plays I saw this weekend were excellent. First up was Martin McDonagh's new play, A Behanding in Spokane. Frequent readers of the blog will know that I am obsessed with Martin McDonagh. He is my favorite living playwright. When I heard he had a new play on Broadway, I was determined to see it. The play has had mixed reviews, and likewise my reaction to it was mixed. It's not McDonagh's best work, but it still is filled with his signature gruesome comedy, and careful plotting of seemingly insignificant details. McDonagh has a gift of revealing the humanity in rather despicable people, and this play is no different. The title refers to an event that happened 47 years previous; when Carmichael (Christopher Walken) was a boy, a group of hillbillies held him down to a railroad track until a train came along and sliced off his hand. Carmichael has spent his entire life looking for his hand. Two teen-aged con artists, Marilyn and Toby (Zoe Kazan and Anthony Mackie), hear about Carmichael and decide to sell him the aboriginal hand from a local museum in order to make some quick cash. 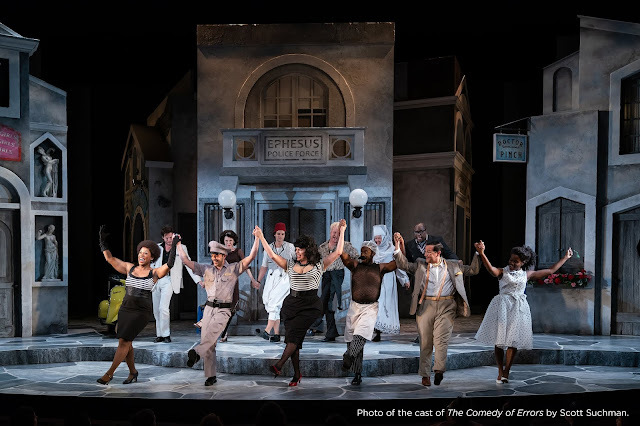 The entire play, except for one scene, takes place inside Carmichael's dilapidated hotel room (great scenic design by Scott Pask -- check out the dangerously wavy ceiling). One scene, in the middle of the play, is simply a monologue by the hotel receptionist, Mervyn (I saw the understudy, Dashiell Eaves). Despite the wonderful delivery by Eaves, this scene is one of McDonagh's major missteps. Since it is the only scene that takes place outside of the one room, it seems to slow the action and derail the pace. McDonagh's other misstep, for me, is the character of Toby, an African American youth in an interracial relationship who varies between yelling and crying. The character never really gels for me, and I'm left feeling as though McDonagh is reaching for something he doesn't quite achieve. Mackie and Kazan are decent in their roles, but they never seem to hit the right tone or delivery needed for a McDonagh script. Kazan spends much of the play with her jaw hanging open in an expression of scared surprise. The knock-out performance of the piece is far and away Christopher Walken. His genius is displayed by the fact that he seems to do everything wrong, but it adds up to a performance that is oh-so-right. He shuffles around the stage, he mumbles his lines (and yet we hear them), he underplays, and yet every moment works. It's an amazing performance and truly the reason to see the production.